Sara Hassan’s project was just one of the incredible ideas to come out of the Cairo From Below Our Urban Futures Ideas Competition. She has graciously written a piece about her experience working on this project to share with our readers. 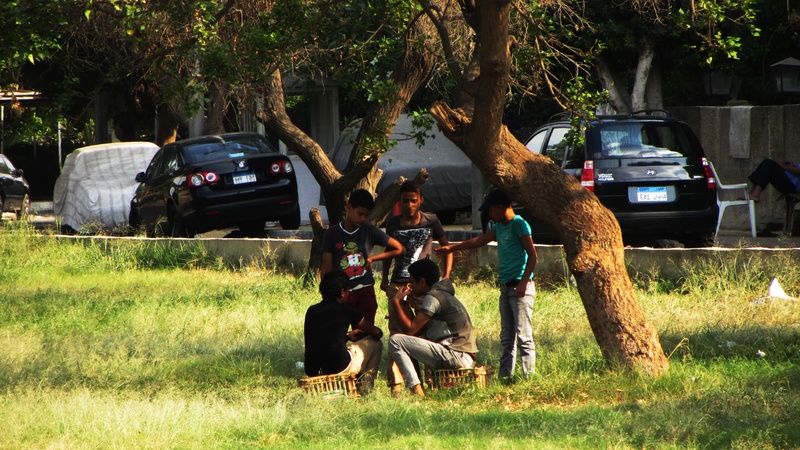 1) Introduction of how public space looks in Cairo. 2) Interviews with people saying what they would like to see in public spaces. 3) Solutions without government help. In Egypt, politics dictates how public spaces look. The regime has passed laws and implemented policies, which restrict the access of Egyptians to public space – places where civilians would gather, talk, interact and even demonstrate or hold protest. Urban spaces that could be used by people to gather and demonstrate were systematically divided or fenced. This policy is not only limited to public spaces, but also affects urban spaces and leads to urban degeneration. Public Space plays a huge role in society. The typical image of Cairo is an over-populated city with a high-density of buildings and a lot of pollution. People yearn for change in their lives. Public space provides the community with a place to relieve the stress caused by the densely populated city, including unemployment, low income, poverty, etc. Here, people can communicate with each other, introduce themselves, celebrate together and engage in sports. Public space is a benefit to community and is compromised of historical, cultural and social dimensions. According to Omar Nagati, an architect and urban planner: “Public spaces unite all people: Men and women, Muslims and Christians, old and young, liberals and conservatives, rich and poor, etc. If you manage to solve this problem, then we have achieved solving major social issues”. Many gardens are still closed with fences and remain unused, while there are other gardens that require an entry fee to enter, to which not all poor people can afford to go. Many parks neither have seats and benches, or even simple playgrounds. The government has ignored public spaces but promotes the development of closed communities (gated communities), private parks with playgrounds and shopping malls. I left some of the chairs and tables in Garden 3, which taxi-drivers started using during their coffee/tea breaks. The next day I saw a few other taxi drivers using the sunshade I made and one of the shwuals as a pillow. The man who serves the coffee/tea had a small tent in which he kept all kinds of recycled materials. I was very fascinated by the creative items he had made. In Garden 2, I interviewed a young man who told me that the things I made are very good and he wished that they would have been there earlier. He then pointed to the garden that is surrounded by a fence and said, “Why is this garden closed? We used to spend a lot of time there as kids and grew up there. Why is it closed? It used to be open for everyone!” When I asked him if he knows the reason, he couldn’t give me an answer. The gardens that I chose are situated in the middle of two roads parallel to each other, as shown in the animated clip. Private gardens are closed with fences, but have benches and playgrounds, while public spaces only consist of grass and palms. That is why I made this animated clip. I wanted to show everyone that it is useless to wait for improvements to happen by the elder generation to change it; it might take years or not even happen. My intention was to make simple objects, which other people could use immediately. Anyone can collect various materials and build interesting objects even better than mine. I also believe that social interaction within a community is very important. People can regularly meet in their local garden to discuss the issue of public space in their neighbourhood and engage in recycling material together. This attitude will create a positive social impact on everyone and raise awareness on the issue. Sara Hassan is an architecture student at Technical University in Vienna. She is currently writing her master thesis, Mafto7 – Public Space in Cairo“ as well as is making a short film. She is also an activist at Amnesty International in Vienna. She hopes to reside in Cairo after her graduation this summer and to continue projects in public spaces in Egypt. ← Water Quality and Cairo, is it Safe?